I swear, this is my last clematis post for a while. But I wanted to share with you a couple of appealing combinations I’ve come across (or in some instances, designed) of clematis with other plants. Some are predictable, others not so much. The first time I saw a clematis planted with a tree, it was in England in 2003 when my tour group was visiting Heale House, an eight acre garden in Wiltshire. The garden has a lovely red Japanese bridge over a river near a weeping willow, a little nursery on site, and other beautiful sights. But what caught my eye as a newly hatched designer was this view (admittedly not a terrific photo) of a burgundy-colored clematis climbing up a Forest Pansy redbud tree. I thought it was an inspired combination. 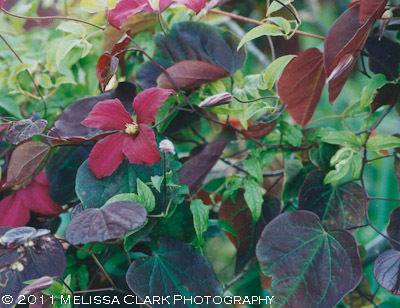 An unknown red clematis growing through the branches of a Cercis canadensis 'Forest Pansy' at Heal House gardens in England. The trick would be getting the clematis established and attached to the trunk of the tree, giving it time to reach the light and do its thing. I’ve tried it once in a client’s garden but some unknown critters kept nicking the stems and we finally had to admit defeat. 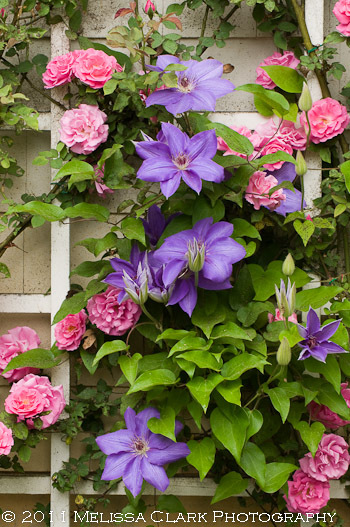 The second combination is more traditional – clematis with roses. 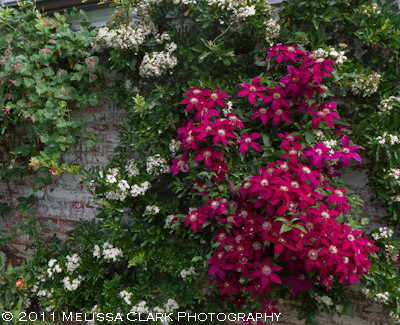 I had a client with a custom-built lattice on the side of her garage, and we planted climbing rose ‘Zepherine Drouhin’ and Clematis ‘Perle D’Azur,’ which proved a very successful match. Last but not least, a couple of years ago a client asked for some climbing plants to soften the side of his brick pool house, visible at the end of the driveway. I opted for a climbing honeysuckle, pyracantha, and Clematis ‘Niobe.’ About five years later, all three are doing well, and the pyracantha/clematis combination looks stunning in May. Left to right: Lonicera (honeysuckle, unknown cultivar), pyracantha, and Clematis 'Niobe' on a brick wall.